THE ONLY WAY TO BECOME WEALTHY IS BY BEING BORN WEALTHY. 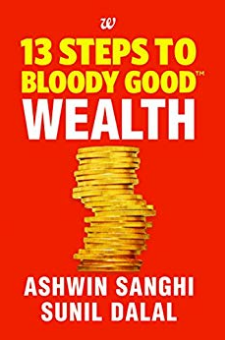 RIGHT?WRONG!In this second book in the 13 Steps series, bestselling author Ashwin Sanghi and co-author Sunil Dalal explore how one can become wealthy even if one is not blessed with the proverbial silver spoon.Taking a radically fresh view of wealth, they show that the journey to becoming wealthy is difficult, but not impossible. With some thought and work, wealth is well within anyone’s reach.The steps presented in 13 Steps to Bloody Good Wealth are easily implemented and do not require anything more than your attention and belief.Through fascinating examples, illuminating stories, personal experiences and common sense ideas, the authors tear away the halo and secrecy that surrounds wealth and how one can earn it. It has been shown that most high net worth individuals around the world have created rather than inherited wealth.Read this little book to understand how you too can do it!